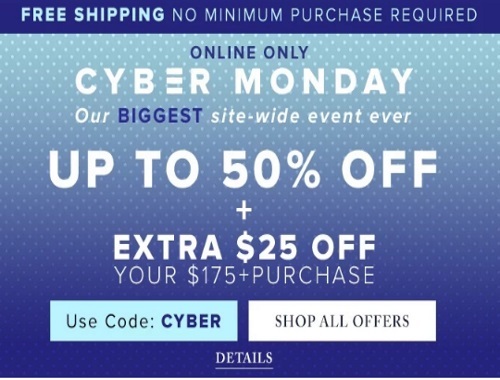 Hudson's Bay has their Cyber Monday sale on now! Their biggest site-wide event ever! Save up to 50% off + get an extra $25 off when you spend $175 or more. There are also special Cyber Deals available including up to 30% off winter boots, up to 50% off small appliances, up to 50% off watches and more! Free shipping applies to all orders today with no minimum too. Cyber Monday deals are valid today only, Monday November 27, 2017. Enter the promo code CYBER at checkout to get the discount.